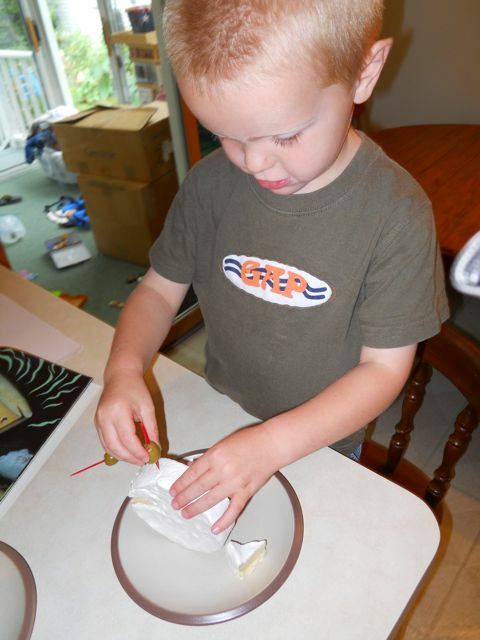 "Research shows that boys will read -- if they are given reading that interests them." I found this quote on Jon Scieszka's Guys Read website, whose mission is to help boys become self-motivated, lifelong readers. This quote was a perfect fit for today, since this was the first author birthday celebration at our house that was a "Boys Only" event. My daughter is now in first grade and many of the upcoming birthday celebrations just won't fit into her schedule. Jon Scieszka, the first person to hold the title of National Ambassador for Young People's Literature, is one of my son's favorite authors. He loves his Trucktown Series, Cowboy and Octopus, Robot Zot, and Squids Will Be Squids. 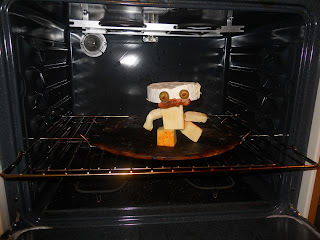 He also loves The Stinky Cheese Man and Other Fairly Stupid Tales which became the focus of this week's birthday celebration. 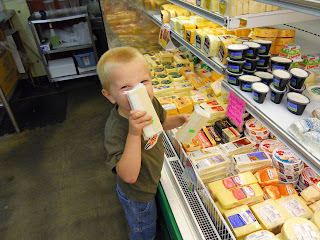 We headed to local food market to find some stinky cheese. 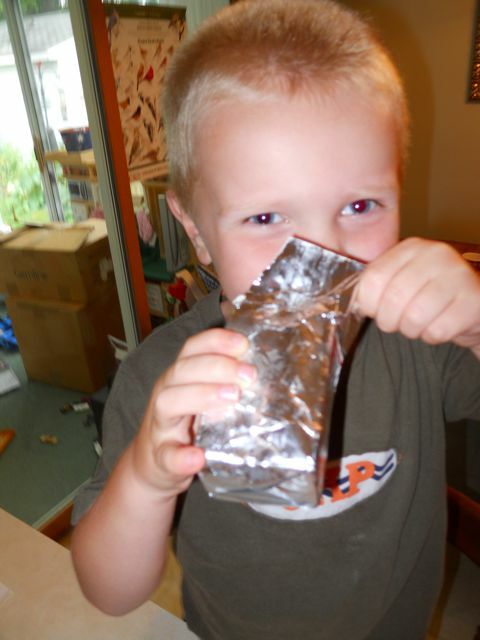 My son immediately started sniffing all the packages. 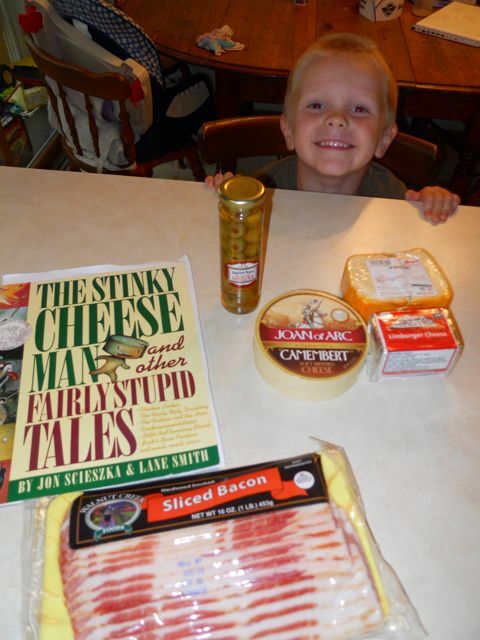 We also were prepared with a list of the Top Ten Stinkiest Cheeses from Hotel Club Travel Blog. 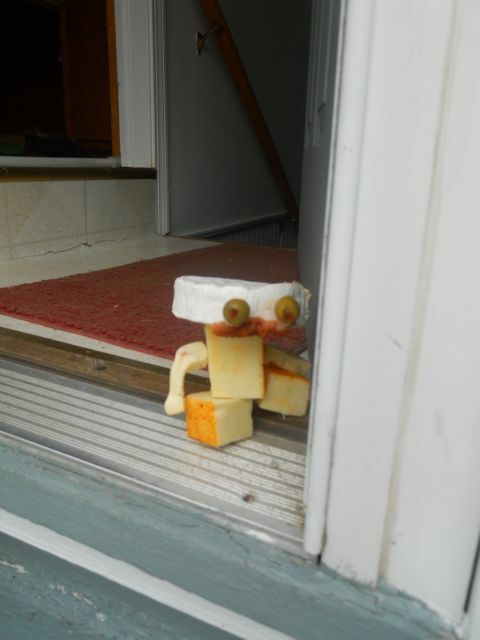 Our goal was to recreate the Stinky Cheese Man. We decided on three stinky cheeses -- camembert, limberger, and muenster. We almost forgot the olives with pimentos and bacon! Next up -- limberger! 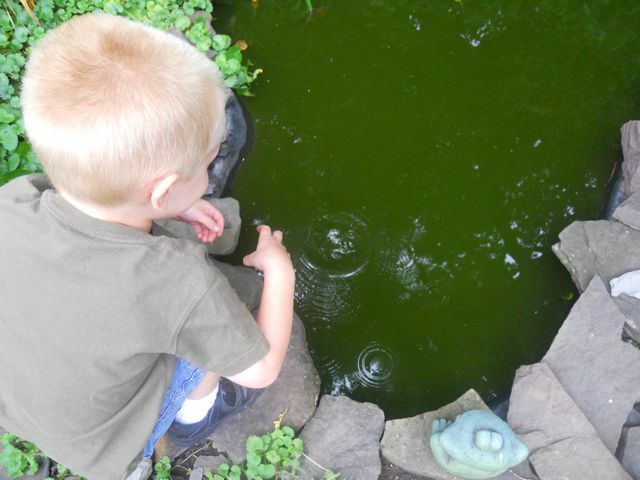 My son later regretted taking this big of a sniff! Limberger was the stinkiest of our cheeses. My stomach was a little queasy for a few hours after this project! We needed a break from the limberger, so we went back to the camembert. My son used toothpicks to add the olive eyes. 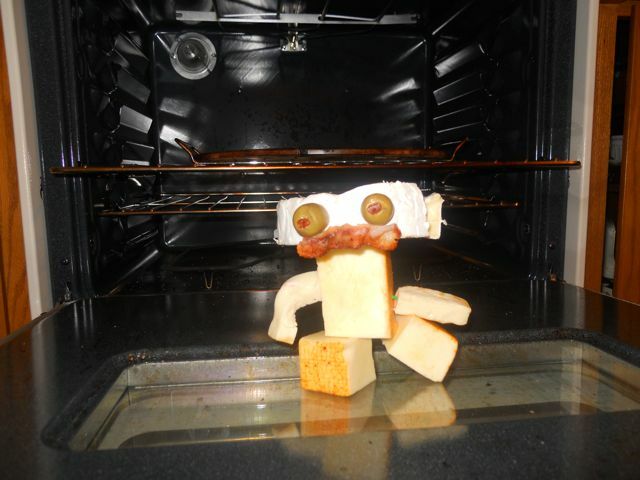 The bacon was now cooling in the refrigerator. I asked my youngest son to smell the limberger but he tried to lick it! We cut a chunk of muenster (aka Monster Cheese) for the body and added toothpicks to attach the head. We both agreed that muenster wasn't that smelly. But, next to limberger my youngest son's diapers smell good (well, maybe that is an exaggeration!). 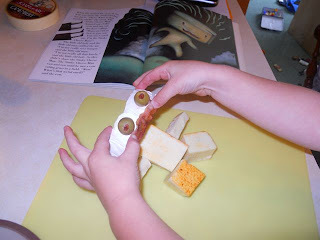 We added the rest of the body parts including -- muenster legs, limberger arms, and a bacon mouth. In the story, Stinky Cheese Man hops out of the oven just like the gingerbread man. My son actually had the idea for this photo! Then to our surprise Stinky hopped down! 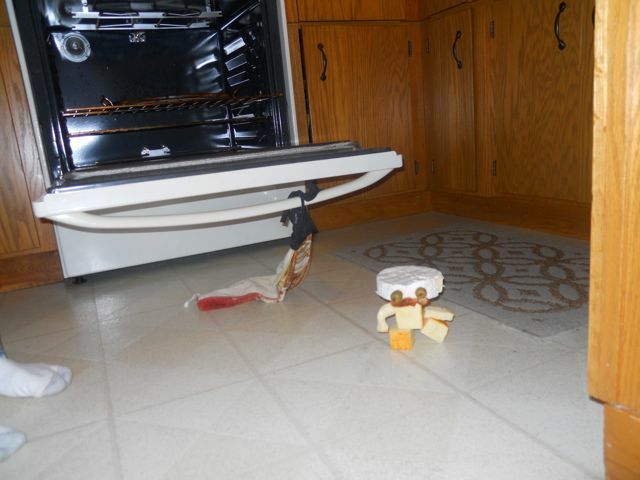 And starting running across the floor! Then, out the side door! Unlike the people in the story, we followed him. He ran all the way to the back yard pond! Oh No! (Gotcha, not really!) But, we did try to recreate the ending of the story where the Stinky Cheese Man is nothing but floating olives and bacon after agreeing to ride on the back of a fox. We found out that olives and bacon DO NOT FLOAT! 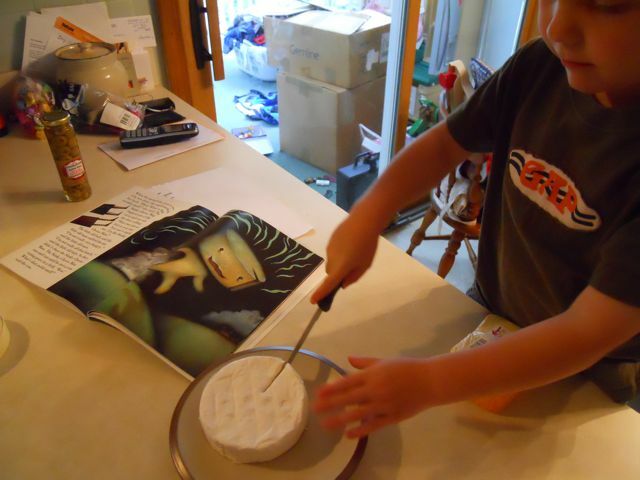 The bottom line is this -- If you have boys and you want them to read, start today by reading a book by Jon Scieszka for his birthday. They will love it! 4. Trucktown Website - My son loves this one! Great post! 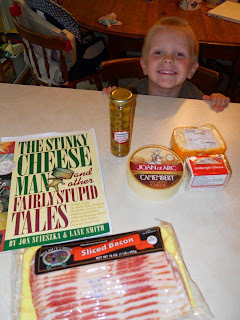 Love the "stinky cheese man"!! Did you eat any of the limburger? 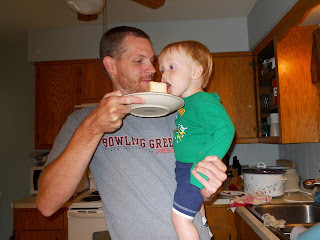 I remember my great-grandpa Bertsch ate limburger! He was one of those old timers who ate lots of weird things- fish eggs from perch, not caviar, muskrat, head cheese,etc. 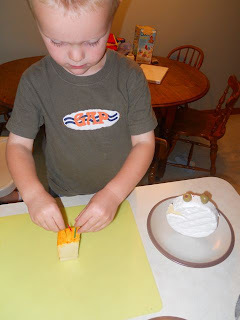 We did try the Limburger cheese. I thought I would until I actually smelled it! My son was not at all interested. Thanks for the history on Limburger cheese. I was unaware!